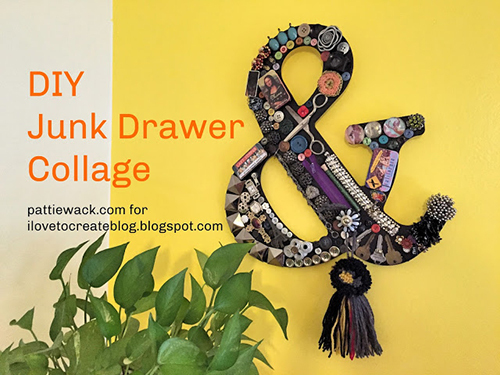 This DIY Junk Drawer Collage is super easy for you to do in an afternoon, and it's a great opportunity to go thru those drawers with the weird things you think you'll need 'someday'. One of my most favorite things to do is mixed media and collage. And this new Aleene's Rapid Dry adhesive really got my attention because it's perfect for my favorite kind of project. It dries fast, it's a gel consistency, and it holds like a super strong magnet. First, grab a drawer that's running over with junk. You know the drawer. It's the one that you have to get a kitchen knife to open it, and you get your finger stuck in it when you try to close it! Then you'll need something to glue everything to. I chose this ampersand symbol I found at Michael's that's a heavy chipboard. And you're going to need a fabulous glue. 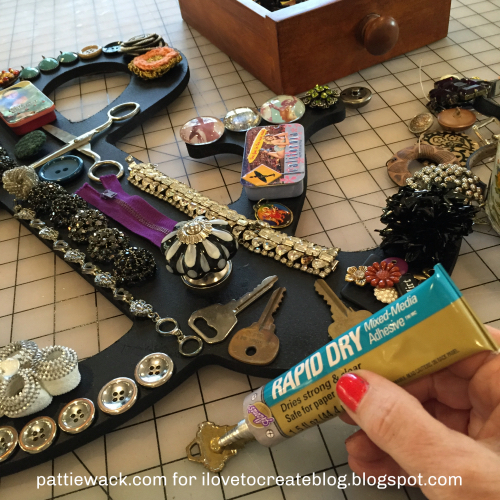 The Aleene's Rapid Dry Mixed Media Adhesive is perfect. 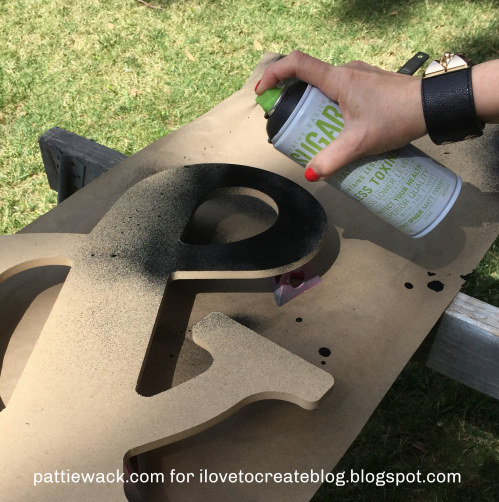 Spray paint your letter or symbol with black spray paint, or whatever color you want for your background. Be sure it's a matte finish because if it's glossy, the adhesive has to work a lot harder to stick. Next, lay out all your junky bits on the painted chipboard. I used tons of buttons to fill all the gaps. Now's the fun part....pick up on piece at a time and apply glue to the back, then press it back onto the board to adhere. It's okay to work slowly, because the adhesive works best when it's allowed to set a minute or two before you press the two pieces together. That's all there is to it! Of course, I just had to add a tassel and a pom-pom. 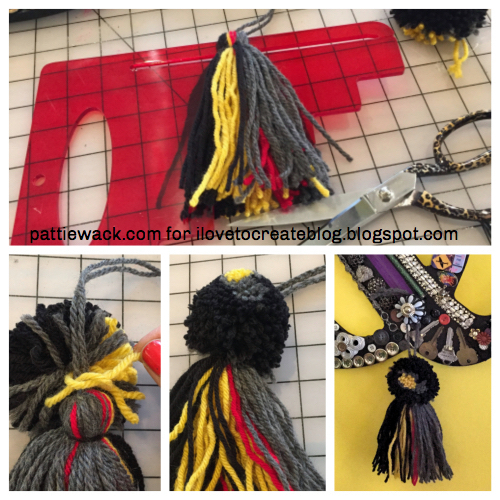 I used the PattieWack™ Tassel Maker to make a 5-inch tassel with four colors of yarn. Then I made a 3-inch pom-pom and tied it to the top of the tassel. The pom-pom has 3 colors of yarn, so it really adds to the eclectic look of the finished collage. I hope you like it! 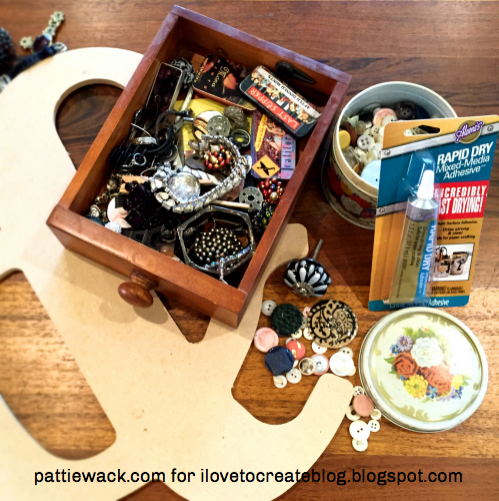 Now you have a reason for keeping those weird and wonderful bits of junk, and can turn it into a fun and funky junk drawer collage. If you have ANY questions or comments feel free to leave them in the comment section below! —See you in the next post! 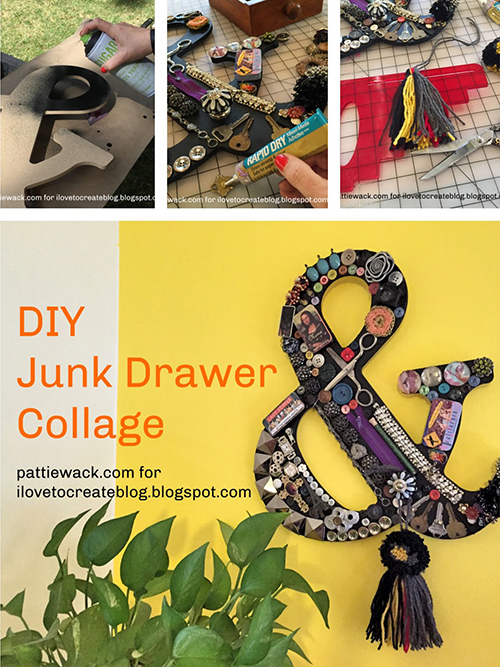 I love the idea of the junk drawer collage. What are other ways to decorate a large letter? I want to use a large letter to put on a friends front door, but not sure what to use.